What do you get when you mix clear blue Adriatic sea with fresh Puglian cuisine and a one of a kind dining venue? A meal to remember. 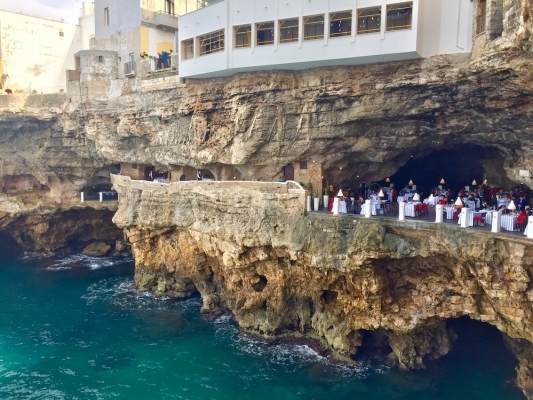 Located in Polignano a Mare in the Puglia region of Italy, Grotta Palazezze offers the unique experience of dining inside a sea cave. Naturally lit by the aqua marine reflection of the Adratic sea below, the summer cavern has been the scene of many important banquets and idyllic dinners. Whether you are planning a romantic meal for your honeymoon in Italy, or a unique dining experience for your family vacation, contact the Italian Concierge to plan an unforgettable trip to Italy. The marine cathedral is centuries old, and in fact was the site where nobility held banquets since the 1700s. Now a 4 star hotel and restaurant, Grotta Palazezze attracts diners from around the world to enjoy the truly extra-ordinary dining experience. Grotta Palazezze is open from April until October, and tables must be reserved well ahead of time (with a credit card). There is parking a few blocks away, and upon entering the street level entrance, you will be escorted down a spiral staircase inside the grotto, leading to the spectacular dining venue. Service is top notch; they even have blankets to warm chilly diners when the wind picks up. The restaurant offers several tasting menus, starting at Eu 110, as well as a la carte service. The plates are well executed, certainly more sophisticated than your average ristorante; but of course it’s the venue and not the food that stand out. The bill will be hefty, but the experience of dining inside a marine grotto is truly unique. Puglia is becoming an increasingly popular destination in Italy, especially during the summer months when its white sand beaches are filled with vacationers enjoying the crystal blue Adriatic Sea. If you are passing through Puglia on your next trip to Italy, or are looking for new destination to explore, let the Italian Concierge craft the luxury custom itinerary of your dreams.